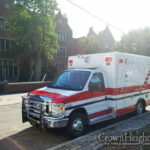 The incident occurred on Friday to the ambulance parked in front of Empire Shteibel – which is strategically parked there to service the southwestern portion of the neighborhood in case of an emergency in which every second matters. 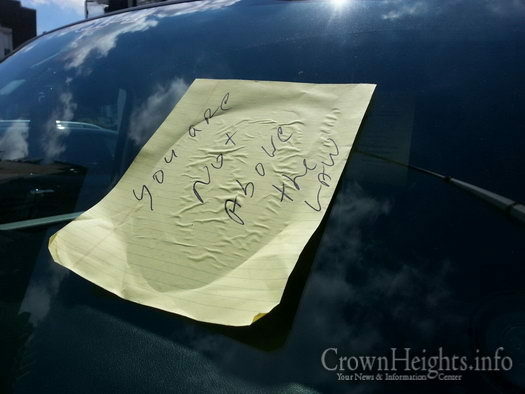 A passerby noticed the hostile message and immediately notified Hatzalah. 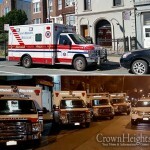 “I was concerned that if they only noticed the paper when already on an emergency call, the time they spend trying to remove it – or the blocked vision of the driver if it were not removed – could potentially cost a life,” the man told CrownHeights.info. 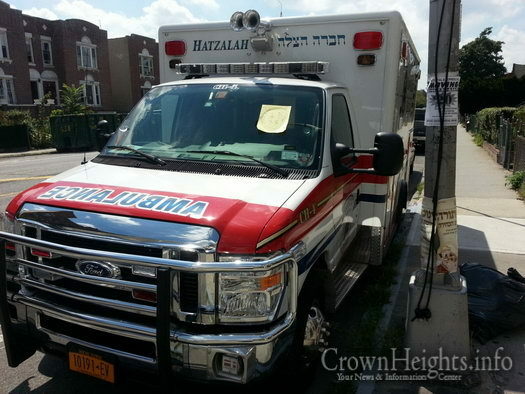 It is not known to us if the incident was brought to the attention of the police, or if Hatzalah will pursue charges of reckless endangerment if the perpetrator were found. Why not report? A crime only “happens” if a report is made to the police. If this hateful crime goes unpunished it could CV”S lead to worse. Plus get the police involved ASAP. We all need Hatzallah. Sounds like some Hatzalah EMS person might have committed a serious crime while on the job, and this is all that the victim feels he or she can do. No it sounds like left wing trash who have long ceded their human agency to the Government protectorate and who seethe at every expression of societal autonomy. See, we can make up stuff too. No, if the ambulance was delayed in trying to save YOUR life would you still feel the same way? I hardly think so. And yes, just like any police car or city ambulance is “above the law” by having the necessary convenience of being able to park anywhere, and pass red lights if necessary, Hatsallah has the same rights and perhaps even more so as they respond asap. Whoever wrote that and stuck it on should be penalized as it could very easily have caused a hazard. 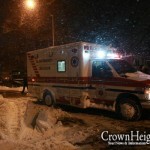 do you know why they park the ambulance that way? because they need to attach it to the cables to recharge it. It’s parked “that way” because it faces a bus stop – so it is never blocked in by parked cars. OBVIOUS to anyone with at least some brain function!! Get used to it. The world is crumbling around us. About the only thing healthy in this degenerating world, is the Jewish people and the Jewish community. Symbols of communal health, like the haztolah and citizen patrol, inspire hate and jealousy amount the various flavors of miscreants that surround us. Make no mistake, they come from broken homes, and won’t dare marry or have kids and are scared to death of dying alone and poor which is the historical lot of those who have no community and no family and this applies to both black and white miscreants. So they will lash out. They hate haztolah, they hate the Jewish community and they hate themselves and the world around them. Nihilists, the lot of them, they wish to see it all burn. 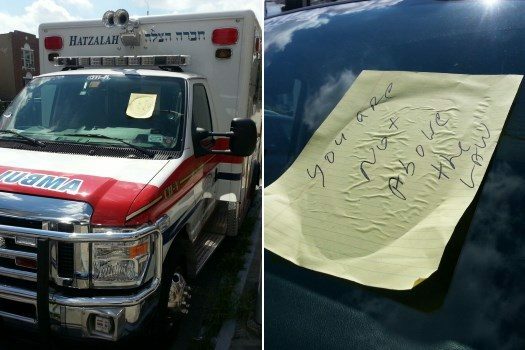 the gut that glued that note to the ambulance needs to be caught & prosecuted but the hatzalah guy was a little bit at fault too for parking the ambulance the wrong way & he could get a summons for something like that.that does not give anybody the right to glue such a note to the ambulance but the hatzalah guy was a little bit at fault too for parking the ambulance the wrong way. the reason the ambulance is parked the wrong was it because thats where the outlet ports that bring in electricity from the shul to charge the equipment. Uh? The OBVIOUS reason it is parked that way is so that it won’t be blocked in by parked cars. It faces a bus stop! We never said we were above the law. We are helping save lives. whichever revolting creature stuck that note on the window is filth and will rot in a gutter.